Three days ago, I received a mail from Jay Campbell. I asked myself if I knew this person. I have this habit of ignoring mails from someone I didn't know. I always consider this as spam so it should be deleted right away. But when I read the mail, I was amazed that another Filipino designer is making its way to global fashion. 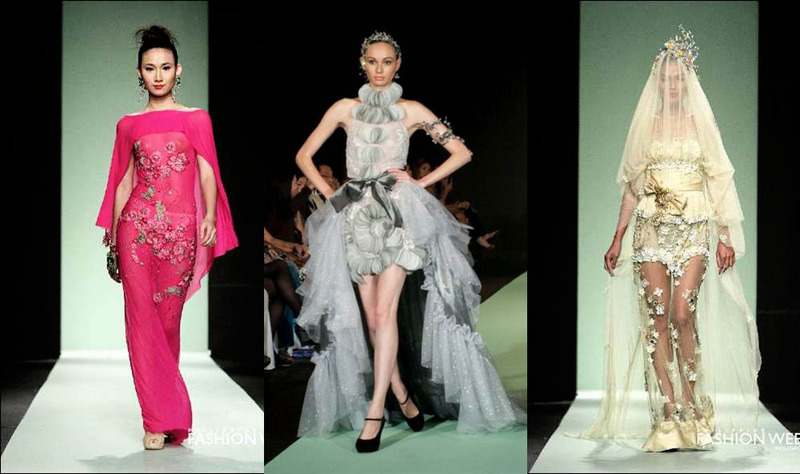 She is Joyce Peñas Pilarsky, a Filipino designer based in Germany. She is known for her paintings, sculptures, photography, singing, and hosting besides designing beautiful garments. She was awarded “Most Outstanding Filipino Artist” in Baden Wüerttenberg, Germany. Joyce is known for her crystal accessories and long silk and lace dresses. Global fashion show organiser and model Jessica Minh Anh has picked Filipino designer Joyce Peñas Pilarsky to join eight other creative fashion houses from USA, UAE, France, Austria, Spain, Poland, Malaysia, and Vietnam at the international J Summer Fashion Show on the 30th July 2012 on the Seine, Paris. The high profile event is part of a series of history making showcases organised by J Model Management, with two previous international success being the world’s highest fashion show in Kuala Lumpur, Malaysia and the first ever fashion phenomenon on England’s iconic Tower Bridge. The grand 60 metre long catwalk will be held on none other than the river’s giant glass boat, Le Jean Bruel, cruising through Paris hot spots including Eiffel Tower, Notre Dame, Louvre, and Grand Palais des Champs Elysees. Showcasing extraordinary collections from four continents and welcoming influential faces from various industries, ambassadors of fifteen countries, and the most celebrated international press, the show is expected to set yet another milestone in the fashion world. With a vision of developing a whole new fashion show experience, Jessica Minh Anh will create the illusion that the models are walking on water, by arranging for guests to sit facing the multi-facetted glass windows surrounding LeJean Bruel. Thanks to a 360 degree view from the boat, the world’s architectural masterpieces along the Seine and the 37 bridges will become a natural backdrop for the grand catwalk. On her decision to showcase Joyce Peñas Pilarsky’s work, Jessica said “When I saw Joyce’s exquisite embroidered lace dresses in beautiful colours, I knew she would be an amazing addition to J Summer Fashion Show. Her collection shows a lot of strength, sophistication, and elegance of modern women who dare to stand out and make a difference. The smooth combination of silk and crystals in her many unique designs makes each piece a must-have creation”. Participating designers and brands will sit front row to enjoy the showcase, while the entire production from models, backstage, to PR will be well taken care of by Jessica and her experienced team of event coordinators. British fashion leader Paul Costelloe, who is a big fan of Jessica’s work, has expressed great confidence in the success of J Summer Fashion Show. "I am definitely amazed by Jessica's creativity and determination to break international boundaries at another spectacular location. Her bold and beautiful shows redefined the modern standard" said Paul Costelloe. Jessica’s previously acclaimed shows have been held at England’s landmark London Tower Bridge, the world’s celebrity destination The Savoy, and the world’s highest Sky Bridge at Petronas Twin Towers, Malaysia. The J Summer Fashion Show will start at 7:30pm on the 30th July 2012 with a glamorous VIP entrance before the highly expected one hour catwalk, and end with a press conference and an exclusive two hour VIP networking party. The show is supported by Serge Louis Alvarez Paris, Club Med Gym Paris, Fraser Suites Le Claridge Champs Elysées, Les Folies De, and Jean Marc Maniatis at Galeries Lafayette among any others. For more information about the J Summer Fashion Show, please visit www.jmodelmanagement.co.uk or www.facebook.com/jmodelmanagement. For press enquiries, please email press@jmodelmanagement.co.uk.